An aerial view reveals the relatively large landmass of Key Largo, the largest of the Florida Keys. Spring Break 1978 was one of the singular events that shaped my life. I was living in Colorado, perfectly happy with my Rocky Mountain high, and working in a photo lab to make a living. I had stayed in touch with a swim-team buddy from high school who was living in Key Largo, Fla. He worked as a treasure diver, and back then divers could still find booty and artifacts on the wrecks of the Spanish galleons that ran aground off the Upper Keys in 1733. I took a dive holiday to Key Largo that year, found I really enjoyed the diving and started thinking that I could make a living there. Lots of tourists were diving John Pennekamp Coral Reef State Park, and I thought if I were to open a little shop to rent underwater cameras and process E-6 slide film, maybe I could get by and enjoy the lifestyle for a year or two. I moved to Key Largo in November of that year. It certainly never occurred to me then that this little island would be where I would meet my wife, where we would raise our daughter and where I would still be a member of the dive community four decades later. Some things have changed over the years, but the diving that enticed me — and makes Key Largo one of the world's most popular dive destinations — remains constant. An accident of geography differentiates Key Largo from other South Florida dive locales. The island's relatively large size (largo is Spanish for "long") obstructs the flow of turbid water from its west side (Florida Bay and the Gulf of Mexico) onto its reef during outgoing tides. And the proximity of the reefs to the cleansing waters of the Gulf Stream enhances visibility and nourishes marine life. An aerial view of Molasses Reef reveals the spur-and-groove coral formations. Having coral reefs this impressive and this close to Miami (Key Largo is the northernmost of the Florida Keys) meant dive tourism was there earlier than almost anywhere else. In the late 1950s divers were towing small boats to Key Largo to explore its reefs. Some divers were even taking photos. My friend and mentor Jerry Greenberg was among the first (see AlertDiver.com/jerry_greenberg). Fencing off this submarine wonderland as a park came in the nick of time. Long regarded as an "oasis of the ocean," the reef came perilously close to being reduced to an underwater desert. Curio collectors wantonly uprooted acres of coral forest, while spearfishermen butchered fish just for the sake of target practice. Chunk by chunk and fish by fish the reef faced systematic destruction at their hands. Only prompt action by conservationists helped establish the reef as a public preserve to safeguard its unique beauty. The queen angelfish is among the Keys’ most colorful reef dwellers. John D. Pennekamp was an editor and columnist for the Miami Herald, and his editorials combined with the observations of respected marine scientists such as Gilbert Voss, Ph.D., helped sway public opinion toward support for the park. State waters extend only three nautical miles from the coastline, and most of the best fringing reef habitat lies six miles offshore. In terms of protecting the true reef tract, the park was more perception than reality in the early days. But for the next 15 years Pennekamp Park provided presumptive protection to the coral reefs offshore. Effective preservation of the main coral reef came in 1975 with the federal government's establishment of the Key Largo National Marine Sanctuary, which extended protection from the edge of state waters to the 300-foot depth contour (isobath). Protections were expanded further in 1990, when the National Oceanic and Atmospheric Administration (NOAA) established the Florida Keys National Marine Sanctuary (FKNMS), which incorporated the existing Key Largo and Looe Key sanctuaries. Managed jointly by NOAA and the state of Florida, the FKNMS covers 2,900 square nautical miles of water, protecting the entirety of the Florida Keys. The genius of the FKNMS is in its system of marine zones, each with specific purposes and regulations. With certain exceptions, fishing is prohibited in sanctuary preservation areas (SPAs) and ecological reserves (ERs), while some areas are open to spearfishing and hook-and-line anglers. The idea behind the sanctuary was to encourage selective recreation offshore, but FKNMS had to ban some activities such as coral collection and, later, collection of endangered conch. The protected areas serve as nurseries for the rest of the reef ecosystem and include the most popular sites among visiting divers. The idea of protected nurseries guided the evolution of these zones; they are the foremost reason Key Largo hosts more and greater diversity of marine life than just about anywhere else in the Western Hemisphere. Aquarius Reef Base is an underwater habitat where scientists can work in saturation. Entry is through an air hatch in which the reflections of fish swimming below can be seen. Mooring buoys are so pervasive throughout the Florida Keys (and the diving world) that it is strange to think of a time when they were not in use. But that is how it was when I first began diving Key Largo. Navigation towers marked a few of the reefs, most notably Molasses Reef and the Elbow, but captains still had to know the best spots to drop their divers. Long before GPS, captains might line up the legs of a tower in a certain way or triangulate some barely visible shoreline references to figure out where they should deploy the anchor. If they were careful and lucky, the hook might land in the sand, but as often as not the line or the anchor dragged through fragile coral. Thanks to the influence and hard work of local residents John and Judy Halas, who developed a mooring buoy anchoring system, mooring buoys were installed throughout the Florida Keys, and anchor damage to the reefs was significantly diminished. More than 490 mooring balls are now available throughout the Florida Keys, and their significance in the protection of the area's corals is incalculable. Given Key Largo's extensive shallow reef system, numerous ships have come to ruin here. The upside of these tragedies is excellent habitat for marine life and fascination for divers. While there are numerous smaller wrecks of uncertain origin, such as the Civil War Wreck, two that are large enough to regularly host groups of visiting divers are the City of Washington and the Benwood. The City of Washington had reached the end of its utility as a 320-foot island freighter when it ran aground near the Elbow tower in north Key Largo while being towed in 1917. Built in 1877, the ship entered the collective consciousness in 1898 for being moored near the USS Maine when the Maine exploded in Havana Harbor in Cuba, precipitating the Spanish-American War. The City of Washington and a nearby Spanish cruiser rescued 90 crewmen from the Maine. A goliath grouper and a nurse shark have an unusual collision near the City of Washington shipwreck. Like most large ships run aground in shallow water (25 feet, in this case), the City of Washington wreck was blown apart to avoid being a hazard to navigation. But there is still sufficient superstructure for it to be recognizable as a ship and to provide refuge for the schooling fish and green morays that reside there. The Benwood was a casualty of World War II, sinking during a time when German U-boats prowled off South Florida. Freighters often ran with their lights off to avoid being easy targets for submarines, but the practice led to more than one collision. On the night of April 9, 1942, while carrying a load of phosphate rock to Norfolk, Va., the Benwood collided with the Robert C. Tuttle, sustaining crippling damage. The Benwood ran to the safety of shallow water but only made it to 25- to 40-foot-deep water before it sank. It too was blown apart for being a hazard to navigation, but enough remains that divers can make out its crushed bow, and the ribs and deck plating are magnets for schools of goatfish, schoolmaster snapper and seasonal congregations of glass minnows. A golden coney hovers above the wreck of the Duane. In my 40 years in Key Largo I have been intimately involved in two big artificial reef projects, the first being fairly easy and straightforward. The second was neither. Our first community shipwreck project was to acquire, clean, tow to Key Largo from Boston Harbor in Massachusetts and sink a pair of U.S. Coast Guard cutters: the Duane and the Bibb, each 327 feet long. While I might be repressing some of the problems associated with the project, it seemed like it all went very smoothly and remarkably inexpensively. Granted, it was 1987, and a dollar went further then, but we spent only $300,000 on the project. That might be the deal of the century considering the popularity of the Duane, especially among visiting divers. The Bibb landed on its starboard side; given its narrow beam and 130-foot depth, it is best suited for technical divers. The Duane, however is perfectly upright and holds a massive concentration of fish: bluestriped grunts in the wheelhouse, Atlantic spadefish swirling about the bow, barracuda alongside the radar tower and gray snapper amidships. The second project was the Spiegel Grove, and it was a nightmare of epic proportions. For the Florida Keys dive community, however, it turned out to be a gift that keeps on giving. Acquired from the Navy, the 510-foot Spiegel Grove was sunk off Key Largo on May 17, 2002. It landed upside down but was repositioned onto its starboard side. Incredibly, three years later Hurricane Dennis set the shipwreck perfectly upright. After the success of the Duane and the Bibb, several of us in the local dive community set about pondering how we could do another wreck, bigger and better. We had some money left over from the last project, so we sent Bill Harrigan, the former FKNMS manager, to scout the derelict ships of the James River Reserve Fleet in Virginia. We settled on the 510-foot Spiegel Grove. With a budget supported by a grant from the Monroe County Tourist Development Council, along with individual and business donations, the Spiegel Grove was acquired from the U.S. Navy in June 2001, cleaned of contaminants and towed to Key Largo. The ship was sunk May 17, 2002, but it sank completely upside down, presumably as a result of internal bulkheads giving way and prematurely flooding the engine compartment. Marine salvors ultimately managed to place the ship on the bottom, where it rested on its starboard side for the next three years. Incredibly, storm-driven surge from Hurricane Dennis set the wreck perfectly upright on July 9, 2005. This project was a lot more expensive than the previous one, costing about $1.5 million once salvage costs were considered. But Dennis did his work for free, and now Key Largo enjoys a wreck of immense stature and popularity. Often considered the symbol of John Pennekamp Coral Reef State Park, the statue of Christ of the Abyss actually sits in federal waters five miles offshore at Dry Rocks reef. Originally donated to the Underwater Society of America by dive equipment manufacturer Egidio Cressi, this 8.6-foot tall, 4,000-pound bronze statue was installed on a concrete pedestal in 25 feet of water on Aug. 25, 1965. This site is actually more popular with snorkelers than divers, but for many no visit to the underwater wonders of Key Largo is complete without a splash on the Christ statue. Alexa Frink snorkels at the Christ of the Abyss Statue. Sunk in 25 feet of water off Dry Rocks Reef, the statue has come to be considered the symbol of John Pennekamp Coral Reef State Park. More dives are probably done on Molasses Reef each year than on most islands in the Caribbean. Bottlenose dolphins swim in the translucent waters off Molasses Reef. Marked by a 45-foot-tall lighted steel tower and more than 30 mooring buoys, Molasses is a massive reef complex with underwater attractions that vary widely between its north and south ends and its shallow and deeper sections. At the south end, areas such as Fire Coral Cave and Permit Ledge are susceptible to significant currents, but these attract horse-eye jacks, schooling barracuda, permit, goliath grouper and ever-present eagle rays. Large schools of grunt swarm there as well, but they are common on most Key Largo reefs, so we won't count them as noteworthy here. To the south the currents are generally less significant (often absent), so sites such as Aquarium, Spanish Anchor and the Winch Hole are generally effortless and rewarding. A great barracuda swims among glass minnows at the appropriately named Minnow Caves. queen and blue angelfish are around on virtually every dive, and turtles frequent this area as well. I have seen manta rays here and even photographed an exceedingly rare blanket octopus (Tremoctopus violaceus). You never know what might come swimming by, borne on Gulf Stream currents. Many other sites are in the Key Largo portion of Florida Keys National Marine Sanctuary, each offering specific attractions to those in the know. At North North Dry Rocks, the angelfish are especially photogenic against the colorful encrusting sponge. 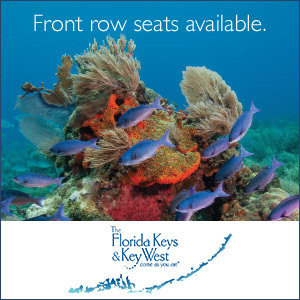 Divers can take in the large field of elkhorn coral at Horseshoe Reef. The seasonal aggregations of glass minnows in the swim-through tunnels of French Reef and Minnow Caves are remarkable. Spotted eagle rays patrol Permit Ledge. Fish are the grand differentiator in Key Largo diving. There are just so many, and they are accustomed to living in a marine protected area, so they do not see divers as threats. For underwater photography, this is a revelation, and it is the reason I have taught underwater photo classes here every year since 1982. A marbled grouper and queen angelfish cross paths at Fire Coral Caves. Getting there: The Florida Keys are "The Islands You Can Drive To," and that is how most people get here, via a flight to Miami International Airport (MIA) and a rental car. Since "the Stretch" (the 18-mile road connecting Key Largo to the Florida mainland) was improved with a barricade divide to avoid the frequent head-on collisions of the past and an elevated bridge to avoid the delays caused by the old drawbridge at Jewfish Creek, daytrippers from Miami and Ft. Lauderdale are the new normal. Conditions: Most of the dives are shallow, at least on the coral reefs (30 feet and shallower). But deep wreck dives can be had on the Spiegel Grove and Duane. On these wrecks it is the current, not the depth, that can be challenging. To sink these large ships upright and still allow 35-40 feet of clearance for shipping traffic, they had to go in deep water. Deeper water is prone to Gulf Stream flow, which is unpredictable and likes to meander. On any given day the current might rip, or it might be totally slack. It can change dramatically between the surface to the bottom or over the course of any given dive. Perhaps the biggest surprise novice divers have when diving Key Largo is how rough it can be when the winds rage. There is no leeside protection here, and a southeast wind can build some pretty heavy seas. The dive operators are savvy and professional, realizing the challenge is not getting guests off the boat in heavy seas but getting them back aboard on a bucking dive ladder. Because Key Largo is normally calm, warm and clear, I think many visitors are unprepared for when conditions turn ugly and may not have experience coping with heavy seas. See more of Key Largo in Stephen Frink's bonus photo gallery.